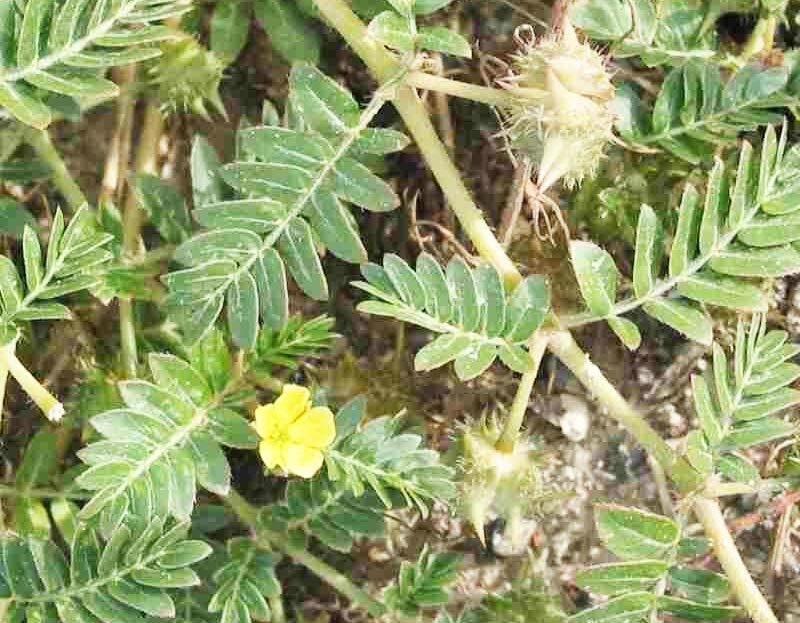 ‘Nerinjil’, also known as ‘Gokshura’ or ‘Devil’s weed’ is a plant that is covered with thorns, comprising small leaves flowers that are yellow in colour. It is the thorns of the herb that are used for medicinal purposes in Ayurveda. The thorn is actually its fruit. Gokshura is commonly found in India and China and is largely used to treat infertility disorders and urinary problems. However, this herb has a host of other health benefits too. Read on to know more about the medicinal values of Gokshura. Polycystic Ovarian Disease/Sydrome (PCOS) is the main cause of female infertility. PCOS may also bring about other health issues such as glucose intolerance and water retention. Glucose intolerance leads to diabetes. Gokshura has the ability to reduce water retention in the body, and the size of cyst can be reduced too. The herb rejuvenates the uterus, is also used as a treatment for low libido, and it helps strengthen reproductive tissues. The herb eases menopausal symptoms too. Gokshura helps increase testosterone hormone levels, improves libido, helps improve erectile dysfunction and low sperm count. Overall, it helps with a healthy reproductive system in men. The herb is also useful in treatment of prostate-related issues by preventing prostate enlargement, due to the presence of stigma, sterols and beta-sitosterol. According to reports by Ayurveda researchers, Gokshura seed infusion is useful in treatment or elimination of urinary or kidney stones. For this, the decoction of the fruits and roots of the herb are used thrice a day for a week as medication. The roots of the herb are sweet, cooling, diuretic, lithontriptic and are useful in renal and vesicle calculi, dysuria, and in vitiated conditions of vata and pitta. All parts of the plant are beneficial in treatment of urinary retention, kidney stone, and fever. Gokshura is effective in curing urinary diseases, and on regular consumption, the herb easily helps a person find relief from bladder problems and other diuretic ailments. Due to its diuretic activity Gokshura is used through a lot of formulations. It has a cleansing effect on urinary bladder. It is due to the lithotryptic property of the herb that it helps regulate the functioning of urinary system. Since ancient times, Gokshura has been used as an aphrodisiac in different cultures. The herb boosts ovulation in women and sperm production in men. Both men and women dealing with issues such as infertility and wishing to start a family can consume Gokshura. It also improves sperm quality and quantity in men. Gokshura is largely used in Ayurvedic medicine as an internal skin cleanser. Teenagers and adults suffering from acne and break-outs can use this as treatment and to prevent recurrence. With constant use, the healing properties of Gokshura can help lend a clear skin, apart from helping with treatment of wounds, skin inflammations, skin eruptions, itchiness and hives. With regular use, Gokshura can make your skin appear younger, slowing down the aging effects. This is due to its effectiveness in fighting fine lines, wrinkles and cell degeneration. It also improves the muscle power when consumed regularly. Gokshura is popular for the major role that it plays in improving cardiac functioning. It is ideal for curing heart ailments like angina, while also reducing the susceptibility of heart attacks. It lowers high cholesterol in the body, and has been proven to reduce blood sugar, hypertension and blood pressure levels. Gokshura can be of help to men who wish to build their muscles. Rather than opt for supplements and steroid injections, this little herb is a natural way to achieve strong muscles, as Gokshura helps with body building, while the minerals present in this herb helps improve body composition and muscle strength. The presence of MOA inhibitors makes Gokshura effective in regulating the hormone serotonin, which influences emotional and mental well-being. When consumed on regular basis, it is effective in treating psychological imbalances, relieves tension and stress, calms headaches, and helps manage psychological imbalances. The herb is anti-bacterial, anti-inflammatory and anti-fungal, and hence is useful as a general tonic and revitalizer for kidneys, liver and urinary tract. The herb is also beneficial in treating a variety of other issues such as hair fall, rheumatism, weak nervous system, obesity, piles, bed wetting, abnormal menstruation, headache / stress, and eye problems. Powder the fruit, and boil 30g of it in 300 ml water, and reduce it to 150ml. This can be consumed twice a day for relief from kidney stones. Boil a cup of water by adding a large spoonful of barley powder and one spoon of Gokshura powder. The leaves of Gokshura can be added to water, boil it well, and drink it through the day during summer months, to prevent recurrent urinary tract infections. Drinking water boiled with Punarnava root and Gokshura (in powdered form), can have diuretic, laxative and expectorant properties. Apart from adding to water, Gokshura powder can be mixed with a teaspoon of honey and consumed at bed time. Although Gokshura is an otherwise safe herb, it should be used only under supervision of a medical professional. People with high blood pressure and diabetes should use it cautiously under supervision of an Ayurvedic physician. Breast feeding women, pregnant women, and children should avoid use of this herb.